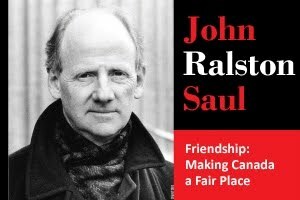 Precis: "JOHN RALSTON SAUL WILL DISCUSS HOW LOUIS-HIPPOLYTE LAFONTAINE AND ROBERTROBERT BALDWIN CAN BE THOUGHT OF AS THE FATHERS OF THE CANADA WE KNOW TODAY, WITH A GOVERNMENT RESPONSIBLE FOR THE BENEFIT OF ALL. THE CATHEDRAL IS A PARTICULARLY APPROPRIATE SITE FOR SUCH A PRESENTATION AS QUEEN VICTORIA’S COAT OF ARMS HANGING UNDER THE CLOCK ON THE REAR BALCONY TESTIFIES. IT WAS PLACED THERE AFTER A TORY MOB BURNED THE PARLIAMENT BUILDINGS IN MONTREAL AND STONED GOVERNOR GENERAL LORD ELGIN WHEN THESE TWO MEN TRIED TO PASS A BILL COMPENSATING PEOPLE FOR LOSSES SUFFERED DURING THE REBELLION. THE CAPITAL OF UPPER AND LOWER CANADA MOVED TO TORONTO. THE GOVERNOR GENERAL ATTENDED SERVICES AT ST. JAMES CATHEDRAL AND SAT IN THAT BALCONY EVERY SUNDAY MORNING WHERE HE LOOKED DOWN OVER A CONGREGATION DEEPLY DIVIDED BETWEEN TORIES AND REFORMERS. MANY PEOPLE TODAY THINK OF ST. JAMES AS HAVING BEEN A TORY-BASED FAMILY COMPACT CONGREGATION, BUT THERE WERE JUST AS MANY REFORMERS: ROBERT BALDWIN AMONG THEM.."
No cost for admission, donations welcome.